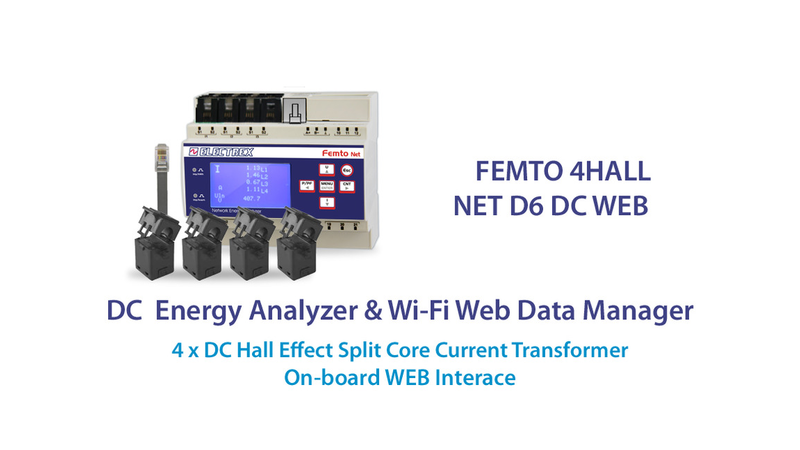 Femto 4Hall RJ45 D6 is an Energy Analyzer & Data Manager for the measurement of electrical parameters in direct current DC and logging of energy. It is equipped with an RJ45 port for connecting to Ethernet networks and and ExpBus port for high speed communication with expansion Modules. Can be transformed, activation via Upgrade (PUK) option, in a net version (becoming Web Data Manager) serving as a bridge and data-logger also for other Electrex devices connected behind it in Rs485. The net version is also a FTP and Web Server, including the Upgrade Web option, displaying on a web page measurements available on the instruments display. The optional Wi-Fi connection permits to manage/display the data, in an already existing Wi-Fi network, from any device having a browser (PC, Smartphone, tablet, etc.). The Femto 4Hall D6 uses exclusively the split current transformers Electrex CTS DC HALL (4 current inputs for up to 4 Hall effect transformers). The Femto 4Hall D6 includes the NFC technology that opens the possibility for the creation of specific APPs for mobile devices regarding energy management. Suitable for applications in renewable energy generation, storage, telecom, data-centers, and other DC systems.